Who could argue? With arguably the best coach, the best facilities, and a stockpile of top recruiting classes, the Gamecock baseball team was going to be a serious threat to make it to Omaha for many years to come. In 2012, Ray Tanner captained an overachieving South Carolina team to a CWS runner-up finish, ending the greatest run in Gamecock sports history. Less than a month later, he traded in his pinstripes for a coat and tie and succeeded Eric Hyman as Director of Athletics at USC. There was no coaching search to replace Tanner, because there was no doubt who his replacement would be – Chad Holbrook. Holbrook had come to South Carolina in 2009 as Associate Head Coach and was being groomed to replace Tanner from day one. He was named the 10th best recruiter in all of college athletics by ESPN in 2010, and was named Assistant Coach of the Year in 2011 by both by the ABCA and Baseball America. His promotion to head coach was a no-brainer. 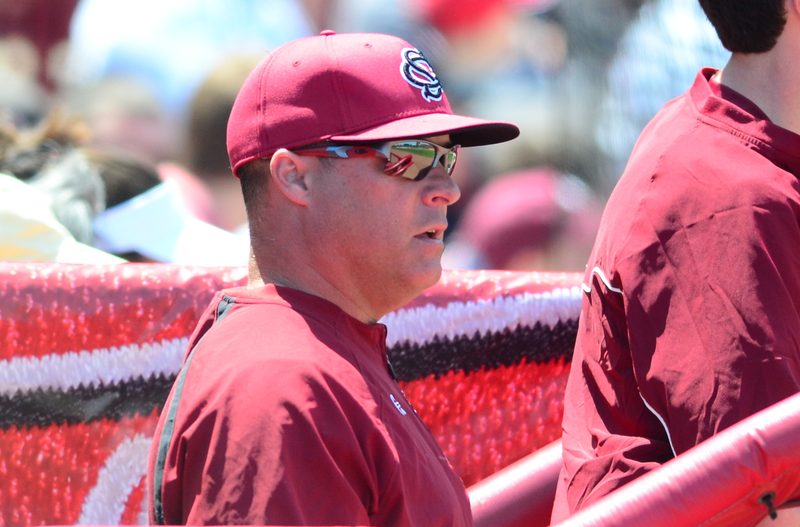 In 2013 he led the Gamecocks to a 43-20 record, but they were ousted in an NCAA Super Regional at North Carolina. It was in that series that his in-game management first came into serious question, bunting his best hitter in the first inning of a scoreless game with a runner on. The Gamecocks had a similar season in 2014, with a 44-18 record. But the season ended in the Regional round with a shocking 10-1 home loss to upstart Maryland, a team that had ended their 28-game NCAA tournament home winning streak the night before. Holbrook was once again called into question for starting super freshman Wil Crowe in an elimination game against Campbell instead of saving him for the Terrapins. The Gamecocks lost some big guns after last season, including Jordan Montgomery, Joey Pankake, Grayson Greiner, Tanner English and closer Joel Seddon. But “The New Normal” meant the Gamecocks would just reload from their stockpile of outstanding recruiting classes and be right back on track in 2015. Optimists had the Gamecocks in the preseason top 5, and even the most pessimistic of projections had the Gamecocks easily in the top 25. An opening season loss to College of Charleston was followed by six straight wins. Losing two of three to Clemson was disappointing, but the Gamecocks reeled off ten straight wins and everything seemed to be, well, normal. But the win streak was broken with a mid-week loss to Winthrop (no worries, everyone loses mid-week games!) After that, the Gamecocks lost four straight SEC series for the first time since becoming a conference member. Last weekend they were simply not competitive and swept by Florida in three games by a combined score of 38-10. The capper came last night, with a 7-4 extra-innings loss at home to Presbyterian College. Read that sentence again. With all due respect to PC, that is a sentence that should never have to be written about South Carolina baseball. Ever. USC is currently 23-15 overall, 6-9 in the conference, and with series left against highly-ranked Vanderbilt, Texas A&M and LSU, are looking like a long shot to make the NCAA tournament. The last time USC didn’t make the tournament was 1999. It’s hard to believe how far and how fast we’ve fallen. Many have thrown out the “everybody has a bad year” reasoning. If Ray Tanner was still the head coach I’d accept that in a heartbeat, because Tanner had earned the benefit of the doubt and then some. Some have said “look at Florida, they were 29-30 in 2013, it happens”. But they, too, have a head coach in Kevin O’Sullivan that has earned a mulligan or two with the way he has built that program. My concern is we’ve seen a steady decline over the last three years under Chad Holbrook, with a complete fall off of a cliff this season. Yes, we made the Supers in 2013 and hosted a regional last year. But honestly, making out a lineup card with the likes of Pankake, Greiner, Montgomery, English, etc., made his job much easier. I honestly don’t know if the recruiting classes we’ve had were overrated, the players simply haven’t developed, or some combination of the two has caused our demise. All I know is the common denominator is Holbrook, whose in-game management has been questioned often in his short tenure. I’m not exactly calling for the firing of Chad Holbrook, because I’m essentially a wuss. I have very human feelings when it comes to talking about firings, and knowing that Holbrook is a family man and is by all accounts a fantastic guy, I simply can’t make that call right now. Plus, being Ray Tanner’s hand-picked guy, he probably has an extremely long leash. But at the same time, college baseball is a pretty big deal at the University of South Carolina. The back-to-back CWS titles are getting further and further in the rearview mirror, and there doesn’t appear to be a return trip to Omaha on the horizon any time soon. We cannot afford to leave our beautiful program in the hands of someone who can’t handle it. And if we leave it there too long, there will be a new “new normal”, and it will not be pleasant. Well thought-out, well written, not a knee-jerk reaction. Holbrook is a great guy, and I’ e defended him, but it’s hard to argue with what you’ve said.